Smooth, wet or oily surfaces can soon lead to accidents due to slipping or falling. Anti-slip surfaces prevent slipping hazards – in this way, ladders, ramps, entrances, steps and shower and changing rooms, for example, can be made safer. Our anti-slip foils are available in a number of surface designs, and they are durable, resistant and easy to apply. In addition, they are easy to clean, they can be supplied with fine or coarse coatings and they are just right for the “anti-slip” effect, whether for indoor or outdoor use. Particularly suitable bases include level, smooth, varnished and unvarnished surfaces, including those made from bare metal, various plastics, wood, stone and ceramics. Our anti-slip foils can be supplied as die-cut moulded parts according to your requirements or as a roll product. For the seat tricycle “Lucky 20” from Wulfhorst the mounting process should be optimised. 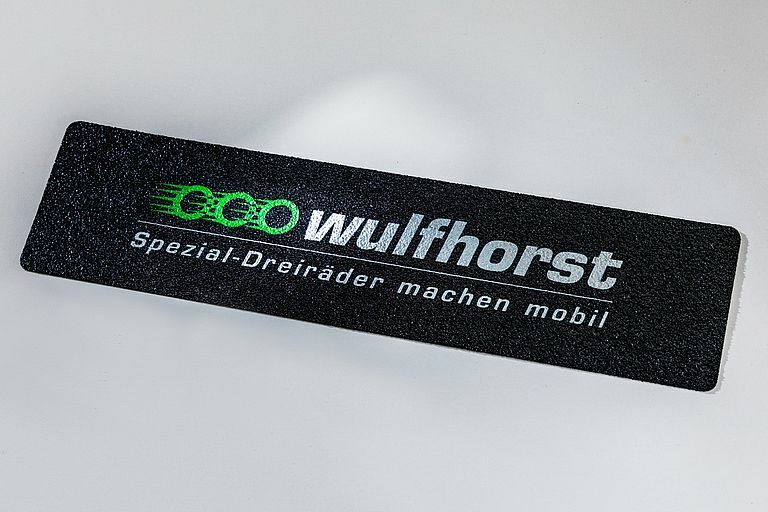 To improve the feeling of security when mounting the tricycle, an anti-slip foil with a particularly high grip was developed.